DECOR: 3/5 - Simple, small, light and airy. Too crowded to appreciate it much. VIBE: 4/5 - Excitement in the air, mostly from the groups of young people. Staff was super friendly too. Underlying sense of impatience from all, though. FOOD: 3/5 - The actual ice cream tasted like very, very cold milk. Not enough flavor! Extra point for toppings though. I didn't know I wanted doughnut on my ice cream 'til I saw it was a thing. SERVICE: 5/5 - Awesome customer service from staff that genuinely seems to like working there. PRICE: $ - everything was around $7. Toppings are free. We stopped by Sweet Charlie's Washington Square location on a chilly Friday night, and were met with what ended up being a wait of around 30 minutes. In a day and age where you can make restaurant reservations on your cell phone as you summon an UberPool to dinner, queuing up that long for dessert just feels anachronistic, and a little bit dehumanizing, too. There were about 20 people ahead of us in line, many of whom were families and groups that were paying together, which I initially thought would speed things along. (Spoiler: It didn't. From what I observed, the near constant queues there can probably be attributed to, for the most part, workflow logistics and limited "cooking"/prepping space inside, not necessarily massive crowd sizes. While I waited, I had ample time to watch the process, and, being both a business-minded person and a backseat driver, I spent most of it trying to figure out a better workflow, up to and including how to redesign the kitchen to make better use of the space. From where I stood in line, I took a peek through the open kitchen door and it looked to be almost as large as the space open to the public, and mostly empty. They could probably make better use of that space. After finally making it to the end of the line, it was another few minutes from start to finish, which actually isn't too bad for a custom dessert. Once you choose a flavor, the process is as follows: The server pours a single-serve plastic bottle of cream (there's also a vegan cream option) onto a cold metal circle. (Could there be a way to reduce trash here, also?) It's chopped, mixed, and mashed. Flavors are added in, such as half a banana, a handful of peanut-butter filled pretzels, caramel, and so on. It's then scraped off the metal in six or so rolled segments. There are only three rolling stations (and a crepe station), plus one guy whose only job seemed to be to hand-torch a single marshmallow once every five minutes. 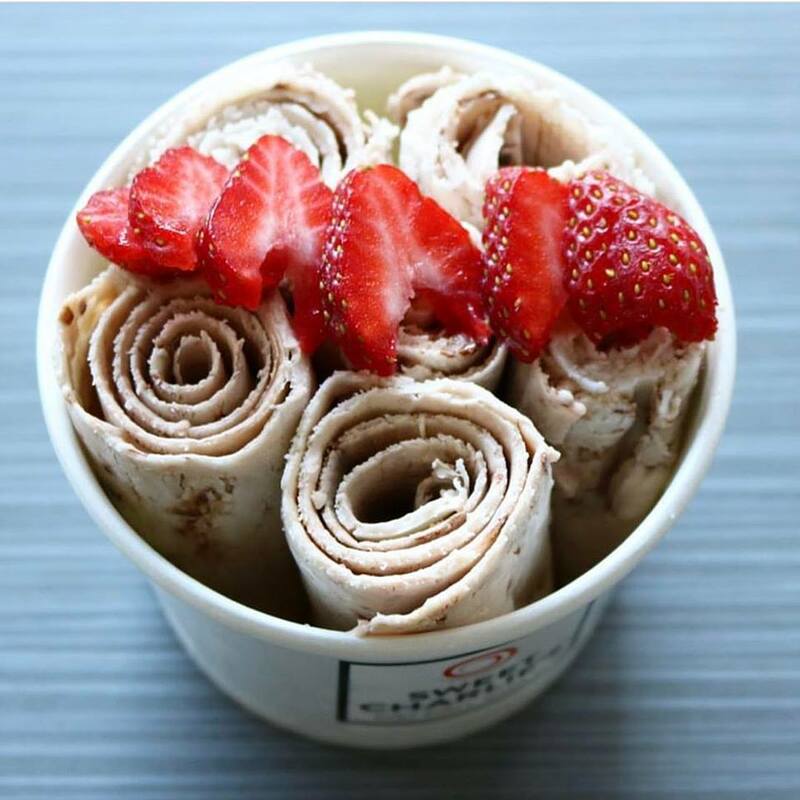 They really should consider adding more rolling stations and making use of untrafficked kitchen space, or allowing people to pre-order online, or have pre-made servings that people can buy to skip the line -- still Instagrammable, minus the hangryness of waiting eons for ice cream. Taste-wise, it was only okay. Too much “cream,” not enough flavor. I ordered Monkey See, Monkey Do, which was made with half a banana and a scoop of Nutella, plus I added pretzels to the mix. It mostly just tasted like milk, though. No banana or chocolate flavor really came through, and the tastiest part was the chopped up doughnut bits I added as a topping. Worth $7, sure, but not worth the wait. The staff and the chit-chat was the best part. The employees were super friendly and knowledgeable, despite what must clearly be a tedious, repetitive job (pouring, chopping, mixing, scraping, and general creamy alchemy) and tedious, repetitive questions ("Your arms must be really strong from working here, huh?") and although I usually hate talking to people, I enjoyed the conversation. The guy that made my order, who I later found out is one of the owners, told us that although they only opened last summer, less than a year ago, they already have a handful of new locations set to open this year, including Atlanta and Las Vegas. My bestie > your bestie. Thanks @bostonista for the treats!